... the orange of the previous template was hurting my eyes just a little bit. so. here's a new theme. and a rudimentary animation of some chicken (yes... they are chicken) as they picked after oat cakes in kew gardens a few weeks ago. ... strawberries; are mine as they ripple across the past few summers. so jammy to find them in my inbox, the subway and elsewhere across the city. they expanded outwards (as they usually do) to others and elsewheres; all the same so closely tied to this city. these are someone else's memories that now extend to mine of strawberries. Edwin George Morgan, poet, born 27 April 1920; died 19 August 2010. Amongst these words, some of his own. How could it not be the Loch Ness Monster song. ... there are some images that keep stirring around my head. One, are those of Lucia Noguiera's film Smoke (1996) that I saw in parts at the Tate on Tuesday. I wish I hadn't been so annoyed by Francis Alys's posturing and would have gone back again to see this rather quiet film about a performance involving kites, umbrellas, two kiosks, a bench and little else. But: the other image is captured and a bit more considered than this glimpse at Smoke. It involves a colourist woodblock print, done in the Great Norther Wastes somewhere in China, and is part of the current exhibition at the British Museum on The printed image in China. After having seen a couple of printmaking exhibitions in the gallery space of the BM I find the space too stuffy and archival for prints that were so clearly concerned with the world around those who made them, commissioned them and used them - like those in the Mexican revolution or now the 20c Chinese prints. The texts that go alongside the prints are in part banal, in part patronising: either it's political as in propaganda, or it's not political as it concerns a landscape. This print here is thus, arguably, about a backward, idyllic rural scene. Done by a generation of printmakers and other artists, the Beidahuang movement, who joined 100,000 demobbed soldiers in the late 1940s to 'cultivate' the plains. The print caught me (unsurprisingly) for its colourist qualities: those fields of hue and contrast. Why are there so many more legs than cranes? And, why does the sedge grow across the birds' bodies? Surely, the artist would have been able to match up his separate woodblocks in a way to match bird body with bird legs; and surely he would know that sedges don't grow on bird bodies? So, why did he divert, subvert or at least distort such realistic representation of rural life in the Northern Wastes. I wonder if the author of the accompanying text is right with their comment that such "nostalgic scene is typical of his lyrical, colourful style". So, is political only accepted as party political ideology? Is there not so much more going on, that is not easily read from without? Says she, thinking of the great commentary that Frontier Blues provided of northern Iran, also part of the culture programme in the big city last week. as David Hockney mentioned, there is something curious going on with perspective. - It's obvious in some of the prints, such as Sunrise at Nanhu/Nanhu richy by Shi Handing (born 1930), 1981. - The horizon line is variable and objects don't necessarily recede. I need to have a closer look at this and what possibilities it affords. 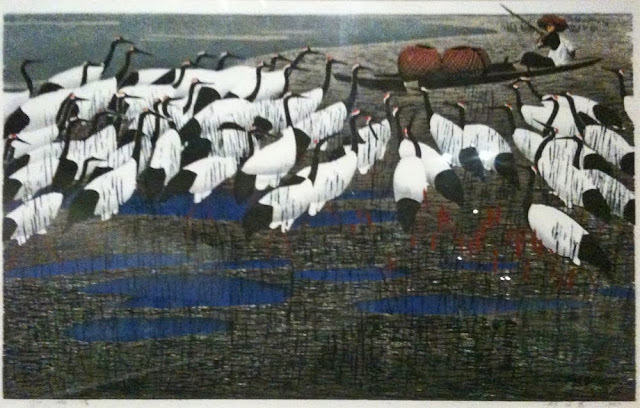 as to Hao Boyi, the artist of Country Sentiments, there seems plenty more of him around the inet. Look at his work and the context. Maybe I'll even find something about the missing cranes' bodies? klee's watch plants resonated with these drawings of the wild carrots: the first one done on day 2; the last one done on day 7. so, any changes to be observed are clearly due to the plant growing, flowering and moving from bud to seed pot; and not with any inability on my part to observe or draw accurately, of course! 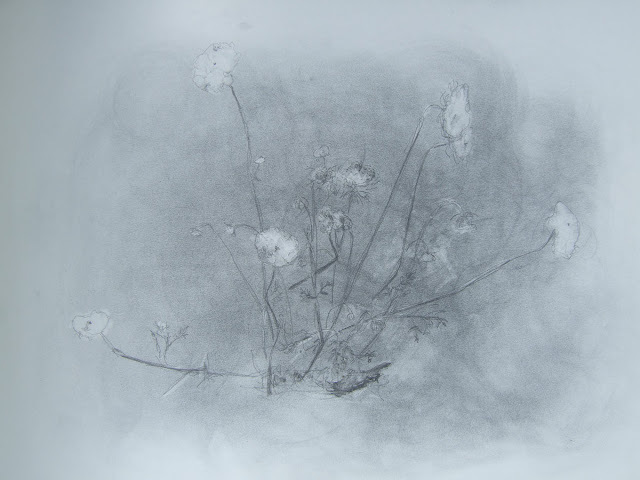 ... i found them last night when collecting the bits and pieces to complete my printmaking logbook. 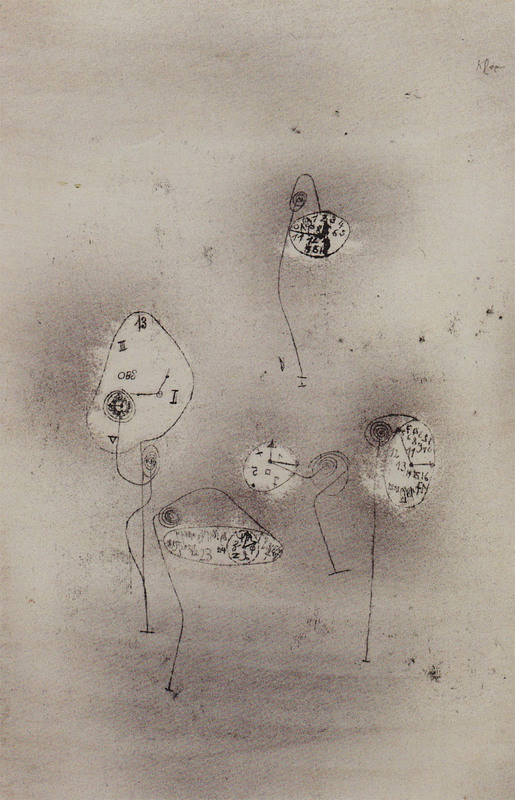 klee's concerns with time - when time falls apart as in Die Zeit, see the post here - occupied me before. so, while searching for examples of how artists use simple printmaking techniques - notably monotype - i finally understood how klee's oelpausen - as an oil-transfer technique work: essentially as monotype backdrawing done on a paper covered with oil paint. - that much for technique. it produces characteristic shadows. but again, the concept grabs me: uhrpflanzen - watch plants. the ambiguity of language in german as it refers to ancient plants also; and in english: watch plants. watch for them and watch them change. my brain is turning around this. 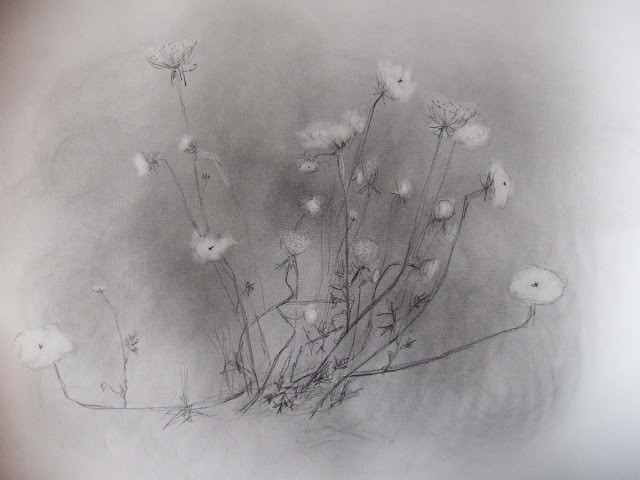 the synergy between concept and technique is one of observation, taking note: the visual imagery is rather similar, albeit differently produced, to my one of my wild carrots drawing. but here's first the watch plants. of my wild carrot bunch lies already two weeks back. i'd be curious to see what they may look like now. should i ask my dad to venture out to the patch (i'm sure he'd find it) and take a pic? (a) the problem that is western perspective. how it's catapults the viewer out of the picture plane. and hockney's many attempts to re-enter that plane, by focus on movement and by tracking the many perspectives that our eyes actually see as we watch. (b) presence and mortality in the countryside. it's somehow a bit clicheed: go back to nature to get a sense of beginnings and ends and the neverending cycles thereof. but it nonetheless led to a series of (quiet) notes to myself. more practically, i took a step towards my idea of temporality of the daucus carota plant by ordering two accordion sketchbooks - hockney's example of drawing the mess of a yorkshire hedge as individual plants in a moving book is being transposed not the wild carrots but the wildly growing border in our backyard. i'll fill the book with the border. i'm confident that there will be more wild growing plants in the border than the pages in the book. i know that if i was recording flying insects i would loose - there seem to be virtually none around whatsoever. what change to the fields and the field from a month ago. but lushest are probably the stills of his paintings at google.